Because everybody loves birthdays, here it goes! 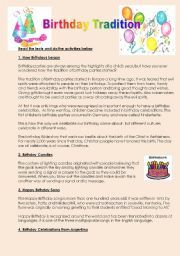 A worksheet about birthday traditions (how it begun, the song, the meaning of candles) in which students will also have a chance to talk about their birthdays! Enjoy it! 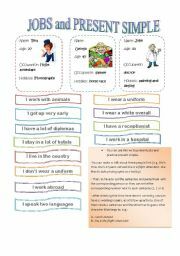 You can use this ws to present jobs and practice present simple. You can make ss talk about these people first.Then, Ss have to cut the sentences and paste them with the corresponding person. This ws contains instructions and a suggestion of a follow up act.. It is completely editable! Have a nice day! This is a very informative task. Gives info. about the main features of a landscape both natural and man made features. It includes a crosswords to do and activities to answer based on images of different landscapes (beautiful pictures by the way). I used it with a 4th grade (age 9 course)and it work very well!! Hope you like it too! Hi everyone! 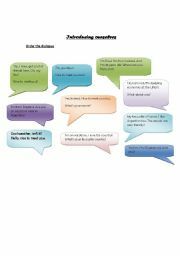 This worksheet was made to work with videos to discuss the topic. You can either download the videos to watch (if it�s allowed) or work with your students on a computer in which they will be able to click on the links themselves. I hope this WS is useful for you! It�s a dialogue between two people that are going to take a course of Spanish together. 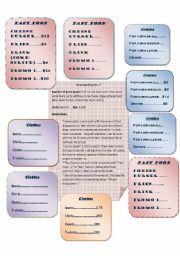 SS can write the corresponding number next to each bubble or the teacher can cut them out beforehand for ss to order the dialogue. Enjoy it! hi everyone! I�m uploading my ppt on Can, the original, at some people�s request. It has 6 parts because it�s too heavy to upload in one piece :( I hope you can make use of it anyhow..hugs! CAN-CAN�T for Abilities (Children-Adults) Editable! Hi everyone! 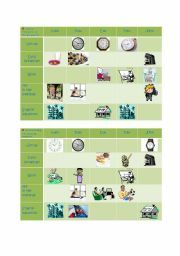 I created this presentation to practice Can (and simple verbs). It used to be a beautiful and colorful PP at first but I had to simplify it because it was too heavy to upload, a real pity!I hope it�s useful anyway. Hugs! This is part 2 of PowerPoint presentation LANDSCAPES... I had to make a shorter version to upload it. You can add more pictures and text!! I used it with my students and it was great as a presentation to the topic.. I hope you enjoy it as much as we did!! 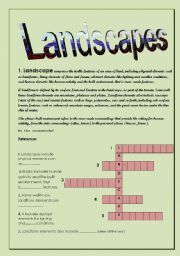 Beautiful PowerPoint Presentation about Landscapes. 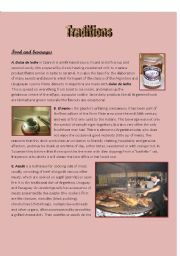 It includes a questions as a follow-up activity... It�s is divided in 2 parts due to size of file. Good Luck! !